Facebook has a feature that uses facial recognition software to “help” your Facebook friends tag you in their photos. If you have this option enabled, any time one of your friends uploads a photo, Facebook will “suggest” you as a match based on the recommendations of the software. It is important to note that your photo will only appear as a suggestion to your friends only. Facebook will not recommend you as a match to someone not on your friends list. Some people may still find this a little unnerving and may not want to be recommended or tagged in photos at all. Sadly, you don’t have a choice in the matter of photo tagging. Facebook allows your friends to tag you in photos, and there is no way to disable this. You must manually un-tag yourself in any unflattering photos. You can also setup profile review, so anything you are tagged in has to be approved by you before appearing on your Timeline. 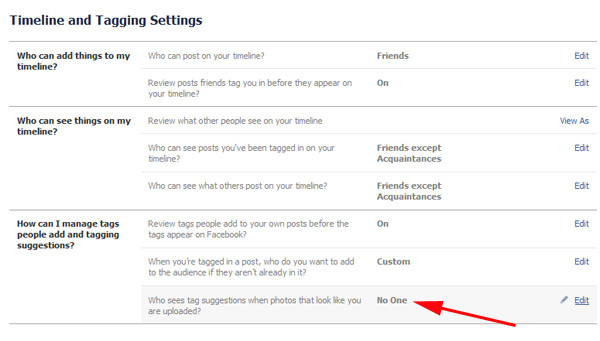 You need to access your ‘Timeline Settings‘ by clicking the ‘Settings’ link located in the top right corner of your Facebook page. Next, click the ‘Timeline and Tagging‘ link on the left side of your page. Then, you will click the ‘Edit‘ link shown below. Set the ‘Who sees tag suggestions when photos that look like you are uploaded?” to No One. This feature still may not be available for all users, but now would be a great time to check – especially if you do not want this enabled on your Facebook account. If you want to stay current on Facebook privacy, safety and scams, then join our community of over 270,000 Facebook friends. *Editor’s Note: This blog post was updated on April 7, 2015 with more current information.